Plastic kits from Germany. This is an excellent line of kits. The first models in the series started out a little rough, but every new release is better than the previous ones, and their latest releases are some of the very best kits on the market today. All of the vehicles have hard plastic, link and length tracks. Revell has also begun a limited re-release of several of the old Matchbox 1/76th scale kits. Unlike Airfix, these Revell kits are clearly marked as 1/76th scale, not 1/72nd. Revell also has a line of figures. 03104 T-80 B The overall level of detail is good. The tracks are fine, but it is missing several key components on the turret exterior. 03107 Panther Ausf. D/Ausf. A Definitely better than their previous WW II kits. Can build into either a D or A version, but there are some minor turret details missing for the D version. The major issue is that the hull roof is too short, creating a glacis that is too long and incorrectly angled (too flat). The turret is slightly too big and too much to the rear. It interferes with the hull hatches and the engine deck. The commander's cupola has wrong number of periscopes (6 instead of 7). The number of bolts on the roadwheels is incorrect. The number of teeth on the sprocket is incorrect (14 instead of 17), making the track links too large as well. 03109 Panther Ausf. G Shares turret, suspension parts and tracks with Panther D/A. Includes optional parts for early and late versions of the Ausf. G, but does not include steel wheels. 03111 Jagdpanther Sd.Kfz. 173 Some would describe this kit as excellent, others are disppointed because it is closer to 1/76th scale, not 1/72nd. 03117 Pz.Kpfw. III Ausf. M One of the very best kits on the market today. Absolutely outstanding kit. Despite the description on Revell's website, there are no figures included. Shortly after 2010 the kit was re-released with slightly a different boxtop and different marking options. 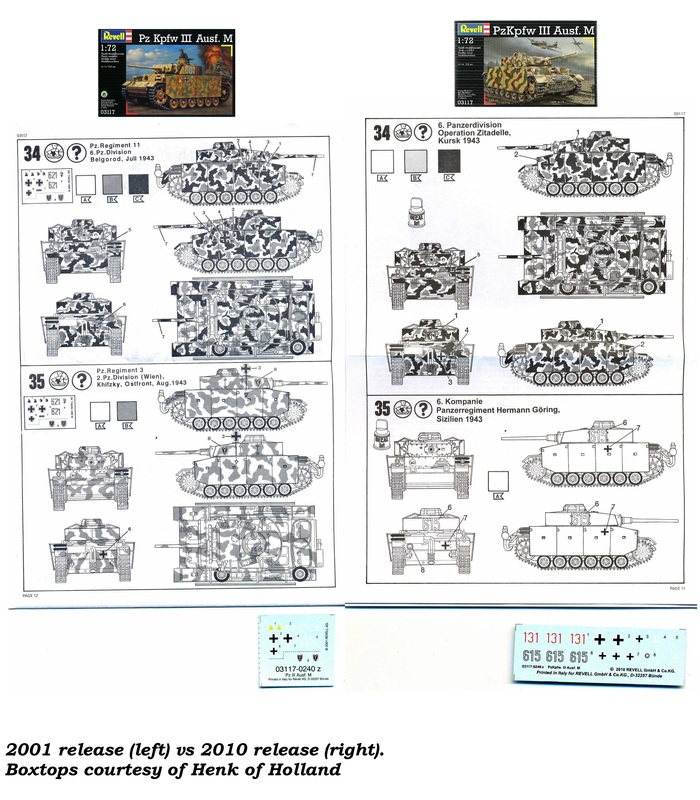 Mostly, when Revell re-releases a kit, the reference number is changed. In this instance it was kept. A comparison can be found here. The tracks of the 3 Revell Panzer IV kits appear to be overscale. (Compared to the Panzer Tracts books, they are by 9.7%.) One of the biggest visual problems this creates is the spare tracks on top of the glacis. The actual spare tracks on the front of the hull should have 7 links. Because Revell's tracks are too big, and because Revell wants to keep the overall width of the spare tracks acceptable, it made part 93 with 6 links instead of 7. The end result is that this track section ends up being 6% underscale. The spare tracks on the lower glacis suffer less, as the 9 overscale track links of the kit are only 1.5% underscale compared to the 10 track links on the real vehicle. Note that the boxart shows the correct number of tracks. Flammentöter exhausts are undersize, though. 03124 M2A2 Bradley One of the very best kits on the market today. Absolutely outstanding kit. 03127 Sd.Kfz. 7/2 37mm Re-boxing of Hasegawa's fairly poor kit. Vinyl tracks. One of the very best kits on the market today. Absolutely outstanding kit. 03148 Sd.Kfz. 164 "Nashorn" Panzerjäger Nice kit, with two (not so) obvious mistakes in the instructions. 03167 Sd.Kfz 165 Hummel The kit represents a late Hummel. One of the vehicles in the decal options is "Clausewitz", which is not a late Hummel however (with the bigger compartment). Inicidentally, Dragon also offers this decal option, but in its "late" kit. 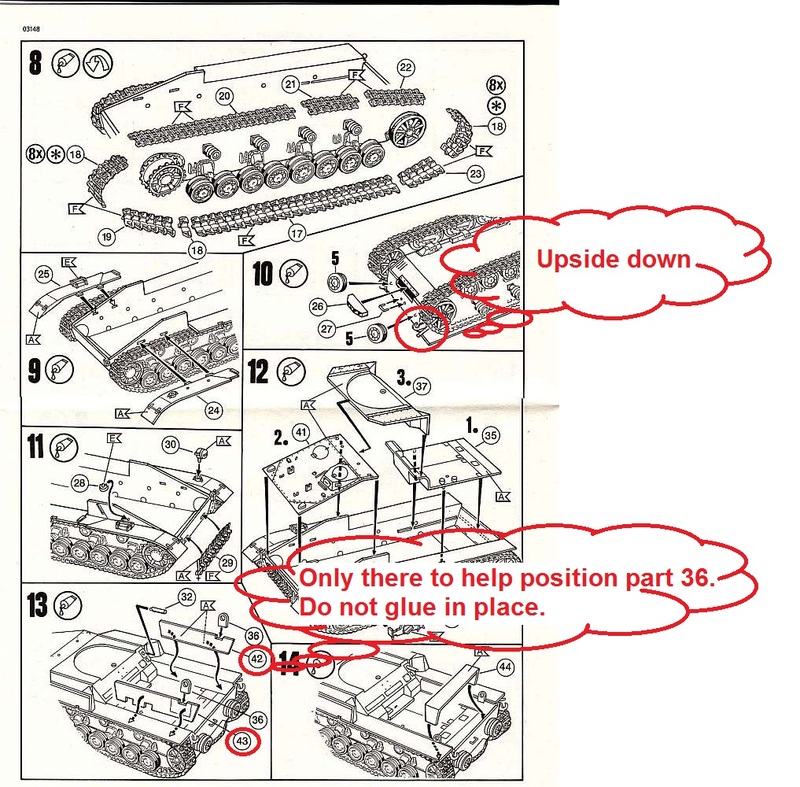 Watch out for two (not so) obvious mistakes in the instructions. Has all parts unique to either the 03176 and the 03169. 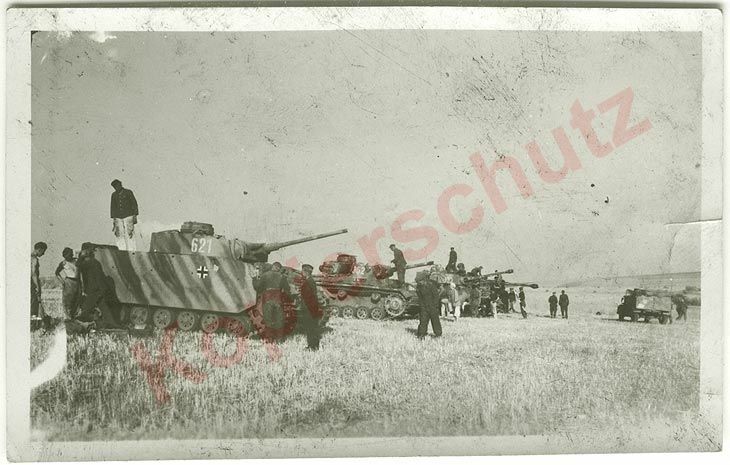 03251 Pz.Kpfw.III Ausf.L Rebox of 03133 with new decals. 03307 Leopard 1A5 & Bridgelayer "Biber"
03202 Jagdpanther & German Pioniere German Pioniere, inflatable boat and Goliath demolition vehicle are all molded in a soft vinyl like plastic. Boat & Goliath are atrocious. - A. Magnus. 02500 German Paratroopers - WW II Most are very nice figures; others, not so much. Forty-four figures in twelve poses, plus open supply containers. Good compliment to the ESCI figure set. If I had to pick only one of the sets, I'd probably go with this one because of the finer details. Weapons include the typical rifles and smg's, with a pretty decent radio operator, and a prone MG-34 gunner. 02502 German Infantry - WW II These are late-war figures, some armed with rifles, Stg.44, panzerfausts, flame thrower, multi-headed grenade, and MG 42's. There is also a prone figure firing a panzerschreck. They wear winter uniforms and for the most part have good poses (with a couple of exceptions). Detail is not as good as Revell's other sets, and some of the heads are poorly detailed. But for the most part it is a pretty good set. 02503 US Infantry - WW II Foty-seven figures in winter dress. Poses are not incredibly original, and there are only 13 of them. Personal weapons include M1 carbines, M1 Garand rifles, "grease-guns", Thompson SMG's, and BAR's. There are two .50 cal MG's on tripod mounts (with two crew figs), two 81mm mortars (with a single crew fig each), and a kneeling figure firing a bazooka (three figures). The Thompson SMG's are underscale. The most original pose is a rifleman in greatcoat loading a clip into his Garand. The commander figure is holding a pistol (of course) and speaking into a walkie-talkie. There is a single non-combat pose, a guard in greatcoat with rifle slung over shoulder. The detail on these figures is very good, but I would have liked more creative poses. Can be used for airborne troops in the Battle of the Bulge. 02508 German Pioneer Troops - WW II An incredibly unique set. Poses and detail are superb. There are only twelve poses, including two figures paddling an inflatable raft, a prone trooper with wire cutters, one armed with a mine detector, one shoveling dirt, one swinging a pick axe, and two poses carrying a wooden beam between them. There is an officer pointing to the side, and a trooper wearing a zeltbahn, running forward carrying a pair of tellermines. The set also comes with several separate tellermines, and two goliath remote-controlled bombs. 02509 British Paratroopers - WW II Better poses than the ESCI Red Devils, but the detail is not quite as good. Kneeling and standing figures firing rifles are really leaning into the weapons, which looks far more realistic than most figures I've seen. Prone rifleman is in a unique pose, much better than most other prone riflemen. Includes a couple of guys pulling in deployed chutes, and two open cargo bins. 02510 Soviet Infantry - WW II This set is the exact opposite of most ESCI sets, i.e. it has excellent poses, but the detail is very poor on many of the figures. There are an exceptional 18 poses, eight of which are unique. The set includes a woman staff officer, an excellent prone light machine gunner, and two fellows pulling a Maxim MG behind them. These are some of the best poses I have ever seen. 02511 German Panzergrenadiers - WW II Another fantastic set. Sixteen poses, with five unique poses, including an officer in greatcoat peering through the periscopic binoculars, two more field officers, a kneeling rifleman pointing his gun up and at an angle, as if firing at an upper story, and a kneeling figure with a Soviet Ppsh submachinegun. Other weapons include rifles, MP-40's, and a kneeling machinegunner with an MG-34 propped on another trooper's shoulder. Excellent detail and poses. 02512 Scottish Infantry, 8th Army - WW II Like the Afrika Korps set, this one contains several unique poses. There's a piper, a guard standing in overcoat, another guard in shorts, and a great-looking troop sitting on a crushed barrel, eating from a tin. Several of the troops are wearing berets, in respect to the Scottish uniform, and the piper in is a kilt. There are several figures advancing at a run, and their poses are great, but I'm not real keen on the foolish looking officer walking with a cane and pistol pointing forward. 02513 German Afrika Korps - WW II There certainly are some unique poses in this set. A guard in a full overcoat; trooper carrying a water jug; trooper in summer outfit drinking from a cup, and two MG-34 gunners, with a tripod-mounted gun. Trooper with goggles on helmet has an underscale MP-40, and the commander is in the obligatory pose pointing a pistol, but this time, the pose is fairly 3-dimensional. Twelve poses. Level of detail is superb, and I prefer this set over the ESCI Afrika Korps figures. 02515 German Artillery - WW II This is one of the nicest sets I have seen. It comes with two howitzers (105mm, I think), one in firing position, and one being towed by a horse team with a limber. There is a full set of crew members for the firing cannon, some without shirts, all in excellent poses, They could be used with any cannon kit. Six horses are pulling the limber and cannon, with an additional horse and rider on the side. There are open cases of ammunition, and personal equipment for the troops, including rifles, packs and helmets, all as separate parts. The detail on all the parts is magnificent. 02516 Siberian Infantry - WW II Like the Soviet Infantry set, this one includes several great poses, but the detail is not quite as crisp as the other sets (but is still very good). Most are dressed in overcoats or winter smocks, but some are in the standard padded winter uniform. There are eleven poses including two on skis, two manning a mortar, and a sniper. One figure is holding an anti-tank rifle in the ready position, but too bad he isn't firing it. Superb set for winter dioramas. The figure with the Mohawk haircut would be from 101st Airborne, while the bandage pack on the helmet was only common at the end of the war. Not all the weapons in the set would be used during an actual parachute drop. 02518 German Panzergrenadiers - Modern This set is very good, although not quite as excellent as the newest Modern US Infantry set. There are twelve poses, with many interesting weapons. There is a prone figure firing a Milan AT missile, a kneeling figure firing a grenade launcher, and several others with rifles and machineguns. The poses are very good, and for the most part, the detail is well done. Five of the poses can be used in a non-combat situation, and pretty much all but one could be used in a combat diorama, with six actually firing weapons. 02519 British Royal Army - Modern I have mixed feelings about this set. The detail is very good, and the poses are pretty decent as well, but many of the figures look out of proportion to me. They have miniaturized legs, and over-sized heads, making them look rather comical. Weapons include mortars, rifles, light machineguns, and an anti-tank weapon which I cannot identify. Perhaps the proportion problem will not be noticable after painting and placed next to a vehicle in a diorama. 02520 US Infantry - Modern These are some of the best figures I have ever seen. The poses and detail are top of the line. Twelve poses, including two kneeling Dragon gunners. Other weapons include M-16's, M-60's and SAW's. Most figures are in full kit. Prone SAW gunner is excellent, as is the crawling rifleman. I can't praise these figures enough. Outstanding. 02521 German Paratroopers - Modern Not too bad of a set. The detail is fairly good, although not as good as the Modern US Infantry. The molding quality on my set is one of the worst I have seen from Revell, with a lot of flash on many of the figures. The poses are fairly original, if somewhat uninspiring. There are a total of 39 figures in 12 poses. Seven of them could be used in combat scenes, but the others seem a little "unhurried" for action. There are a few unique poses: a Milan gunner setting up the weapon (not firing it), a trooper pulling in his 'chute after just landing, a prone sniper, and a trooper loading a grenade launcher. The other poses are more typical. 02522 Modern German Fast Reaction Troops (KSK) Love at first sight. Nice detailed and correct equipment/weapons, but much bigger than 1/72. Figures are 31 - 32mm. Can be easily converted into GsG9. One pretty nice civilian prone figure is included. However, they are very hard to be mixed with other existing kits. Maybe the Atlantic Afrika Korps could do the task. If you are much into making figures to represent PC games like Counter Strike, this is it. - R. Haddad. 02523 WW II British Infantry A pretty nice detailed kit with nice poses, suitable for Normandy. A good one "to go with" the freshly Cromwell. Many devices never released in pastic now are available, like the 2" mortar. - R. Haddad.